With 6.00mm hook make 40ch, change to 5.00mm hook and work 1tr into 4th ch from hook, * make 1ch, miss 1ch, 1tr into each of next 2ch, * rpt from * to * to end. Turn. Pattern Row 2-3 - 1ch, 1dc into base of 1ch, 1dc into each dc to end. Turn. Pattern Row 4 - 3ch, 1tr into next dc, * make 1ch, miss 1dc, 1tr into each of next 2dc, * rpt from * to * to end. Turn. Rpt Pattern Rows 1-4 seven more times until 33 rows have been worked in all. Starting with 1ch, 2dc into base of 1ch, work two more rows of 1dc into each dc around all four sides of dishcloth, working 3dc into corners and ss to first dc on beginning of each row. Fasten off. Finishing - Sew in and tie off loose ends of yarn. 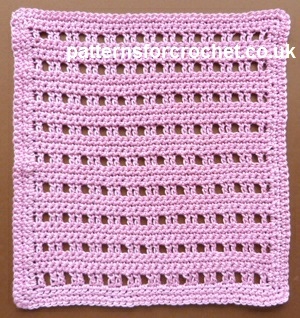 Hope you enjoy this free crochet pattern for a cotton dishcloth. Please do not re-post any of the patterns or pictures from this site as your own. put a link back to this website.